Despite having California right in the title, the park known as California Adventure has never had a coherent theme. Was it a movie studio? A fantasy-take on the golden state? or a wistful glance at the history of seaside amusement parks? There was no one theme, but it was trying to capture the gestalt of California. The new ‘theme’ is even less coherent (but that’s a different article) and it requires the removal of everything that greeted guests and set up the park’s original story. The new story (about Walt’s arrival in California) doesn’t need railroads (despite the very important role they played in the early life of Walt Disney, including his arrival). So that means it’s time for the California Zephyr to hit the road. But some good will come of it, the Disneyland Resort has donated the California Zephyr train previously located at the entrance to Western Pacific Railroad Museum in Portola, CA. 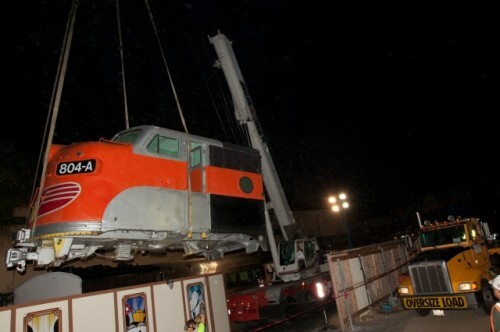 The train and related artifacts, which were part of the entrance to the theme park, arrived at their new home August 6 and will become part of the museum’s Zephyr Project collection. Plans for a gallery dedicated to sharing the legacy of the California Zephyr are underway. The Walt Disney Family Museum is celebrating its first anniversary by asking What Would Walt Do? 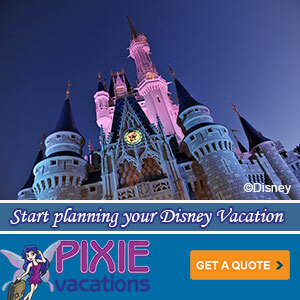 Specifically they want you, to channel your inner-Walt and create a promotional video for the museum then upload it to Youtube. The best videos will win prizes, including a trip to the museum and a private tour. When The Walt Disney Family Museum in the Presidio of San Francisco was looking for a way to illustrate the ancestry and family roots of Walt Disney, they turned to an imaginative Bay Area artist and mapmaker named Dave Stevenson. His work, which will be on exhibit in the Lower Lobby of the Museum from September 15- to January 3, has been seen at the entrance to the Museum’s first gallery by thousands of visitors since the Museum opened. Stevenson’s colorful map charts the journey of Disney family ancestors from Isigny-sur-Mer, France ( d’Isigny was Anglicized to Disney,) through England, Ireland and Canada to the United States. Stevenson uses geography, cartography, graphic design, and artistic inspiration to create his maps. These works of art include history and landmarks, people, plants, and animals to communicate an accurate yet romantic, playful, or dramatic view of the places and events that he charts. Included in the exhibition are maps of Maui, Antarctica, Egypt, and India, as well as the famous map, Treasures of the World, included as an insert in National Geographic. Also featured are maps of Antarctica, Egypt, the Galapagos Islands, the Lewis and Clark expedition used in marketing Lindblad Expeditions and maps of the Mediterranean, and India, as well as a dramatic piece that charts the spread of the Black Death. A map of the Presidio of San Francisco drawn especially for this exhibition will also be on display.